With Prestashop Marketplace Booking and Reservation System you can convert your Prestashop store to multivendor booking marketplace. This module allows your vendors to add booking products on the online marketplace and receive bookings 24 hours a day. Sellers can add various benefits/features/discounts with the booking product. Admin has an option of whether to consider the last date for the price calculation of a booking product or not. Admin can add booking products on behalf of the seller as well. Add booking price rule on behalf of seller to their products. Sellers can add the date range booking product type. Sellers can disable booking of a product for special days(i.e. Mon, Tue, Wed, Thu, Fri etc) by selecting the days. Disable bookings for specific dates by setting up the date range. View total available quantity, total booked quantity and price of a booking product for specific dates or special days under “Availability & Rates” tab. Sellers can add the time slots booking product type. Add multiple time slots for different date ranges. For different time slots, add different prices for booking a product. Disable the time slots for booking a product for special days(i.e. Mon, Tue, Wed, Thu, Fri etc). Disable the time slots for booking a product for specific dates. View available quantity, price, booked quantity and status of a booking product for different time slots for a specific date and special days under Availability & Rates tab. 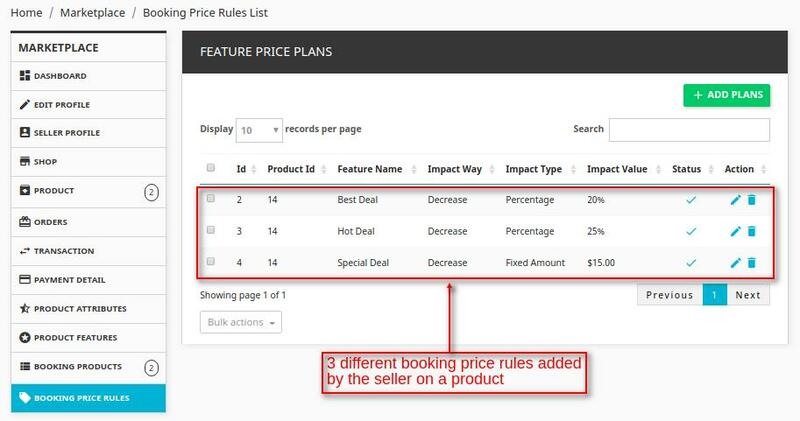 Booking price rule functionality which allows the seller to provide various features, benefits, and discounts to the customers for booking the product(s). Add booking price rule for a specific date range or specific date. Set special days for which booking price rule(made for a date range) will be applicable. A customer can view booking products on the category page and book it anytime 24*7 as per their convenience. A customer can avail various benefits and discounts by booking the products online. For installing Prestashop Marketplace Booking and Reservation System you need to install Prestashop Advanced Marketplace module first. After installing Prestashop Advanced Marketplace module you can start the installation of Prestashop Marketplace Booking and Reservation System. Consider Price For ‘Date To’- If enabled then ‘Date To’ or ‘Last Date’ will be considered for calculating the price while booking a product. For example, if you book a hotel room which costs you $100 a day for the date range 17th May – 20th May. If ‘Consider Price for Date To’ is enabled the number of days would be 4(20th May included). If “Consider Price for Date To” is disabled, then the number of days would be 3(20th May not included). Show booking price rules to customers- If enabled by admin, then booking price rules will be visible to the customers on a product page at the Front End. After the installation of the module “Booking Products” and “Booking price Rules” tabs get available for the sellers under ‘My Shop’. 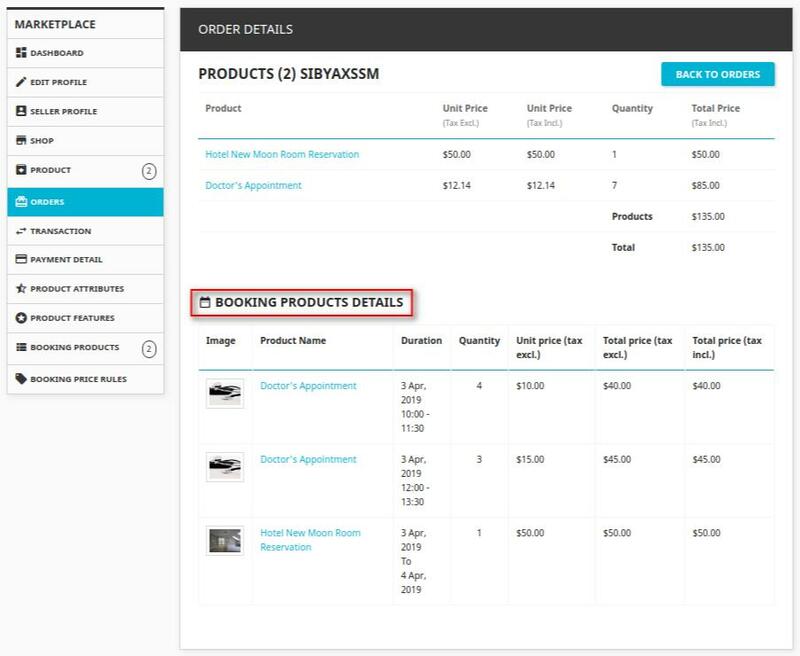 When a seller clicks on “BOOKING PRODUCTS” tab, Booking Products List page gets opened and seller can add a booking product by clicking on ‘ADD BOOKING PRODUCT’ button. Product Name – In this field, seller has to enter the booking product’s name. Product Booking Type – In this field, seller has to set the product booking type as “Date Range” or “Time Slots”. Price – In this field, seller has to set the price of a booking product. Quantity- In this field, seller has to set the quantity of a product. Category – Set the category for a booking product. Default Product Category – Set the default category for a booking product. Once the booking product has been added by a seller, it goes to admin for approval. Admin can view seller’s booking product by navigating through Marketplace management->Manage Seller Booking Product. Edit the details of seller’s booking product. Delete the seller’s booking product. By clicking on ‘Save & Stay’ button under Information tab, a seller can add further details of a bokking product. While adding a booking product based on date range, a seller has to set “Product Booking Type” as ‘date range’ and price of a booking product per day. After entering the basic information of a booking product and setting “Product Booking Type” as ‘Date Range’, a seller has to set an image of a product. Once the image has been uploaded by a seller, he has to click on save and stay to proceed further and set the date range for which he wants to disable a booking product. Disable Special Days – In this field, a seller can disable booking of a product for special days. For example, if a seller does not want any bookings for Friday then it can select Friday from “Select Special Days” field. Once a seller has disabled the booking of a product for special days, then a customer cannot book that product for the days disabled by a seller. After selecting the date range for which the seller wants to disable bookings he has to click on Save button so that bookings gets disabled for the specified date range. Once a seller has disabled the booking of a product for a specific date range, then a customer cannot book that product for days disabled by the seller. 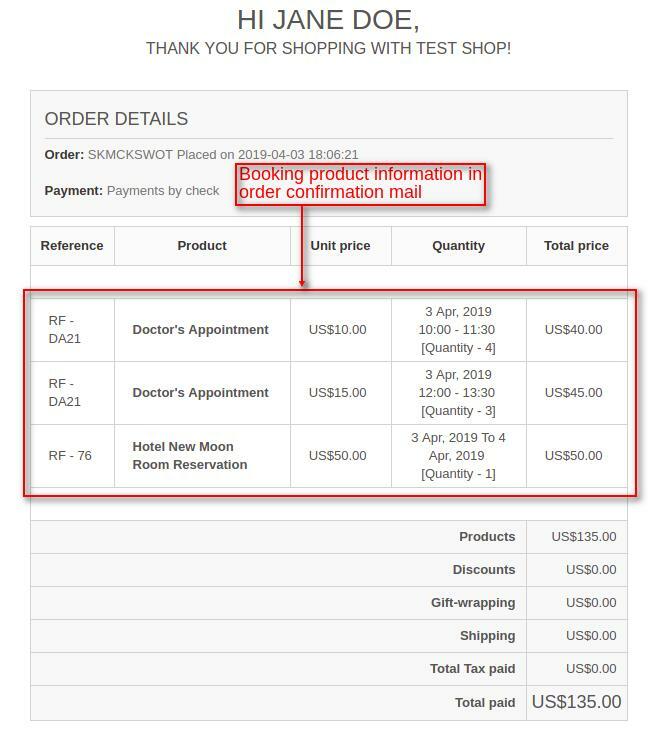 While adding a booking product based on time slots, a seller has to set “Product Booking Type” as Time Slots and price of a booking product per slot. 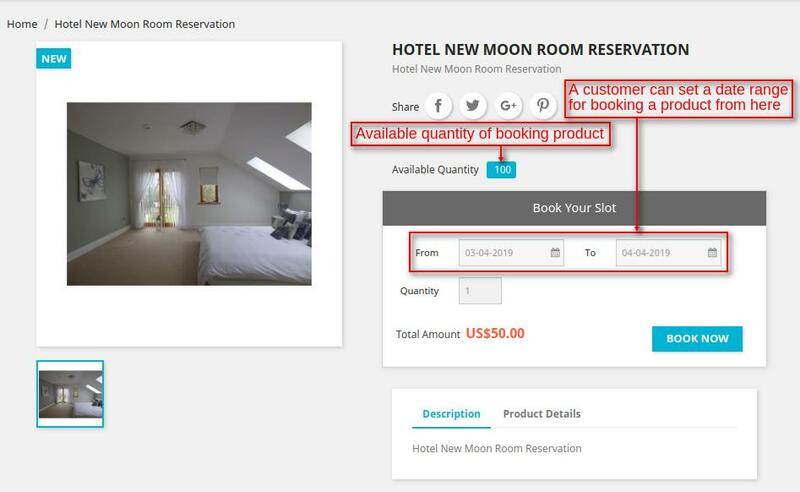 Once the seller has entered all the basic information of a booking product and set Time Slots in “Product Booking Type” field then he has to set an image of a booking product. Once the image has been uploaded by a seller, he has to click on ‘save and stay’ to proceed further and set the time slots for a booking product. Setting Price for the slots. A seller can set different prices for different slots, enable or disable a slot, and delete the slots. A customer can book a slot for a particular date by selecting the time slot and booking quantity for that particular time slot. Once the seller has added the time slots he can disable it for special dates or a specific date range. 1. Disable Special Days – A seller can disable the time slots for booking a product for special days. Once a seller has disabled the booking of product for special days, then customers cannot book that product for time slots for the days set by the seller. A seller can disable the time slots for booking a product for specific dates. When a seller clicks on “Save” button a pop up appears on the screen where he has to select the slots which he wants to disable and then clicks on “Done” button. Once a seller has selected the time slots and clicks on “Done” button, then a customer cannot book a product for the disabled time slots for a specified date range. Once the specific dates have been set by a seller to disable selected slots, he can enable the time slots he disabled while setting up the specific dates or he can disable the time slots which were enabled by clicking on ‘edit’ button. Once the seller has disabled the time slots for booking a product for the specific dates, then a customer cannot book a product for those time slots of specific dates. The time slot 18:30 – 20:00 is not visible to a customer as it has been disabled by a seller for the specific dates. Under “Availability & Rates” Tab, a seller can view time slots, total available quantity, total booked quantity and price of a booking product by clicking on a date. Special days and specific dates which have been disabled by the seller for booking a time slot of a product are visible as faded on the calendar. A seller can add booking price rules to the products by clicking on “Booking Price Rules” tab under “My Shop”. A seller can add a new booking price rule by clicking on “Add Plans” button. Booking Product Name – In this field, a seller has to enter the name of a booking product for which he wants to add a booking rule. 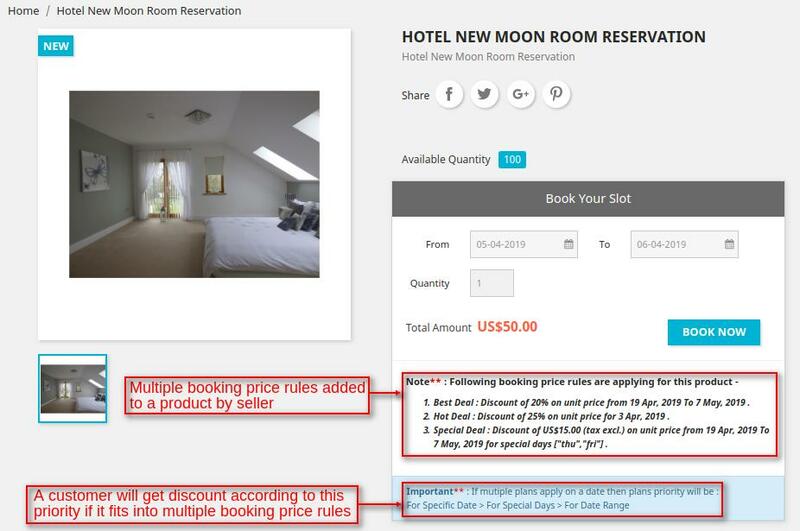 Booking Price Rule – In this field, a seller has to enter the name of booking price rule which will be visible to the customers at the Front End. The seller can add booking price rule name in multiple languages. Date Selection type – In Prestashop Reservation and Booking System, a seller can add a booking price rule for a specific date range or a specific date. For Special Days – The seller can set special days in a date range on which the booking price rule will be applicable. For example, a seller has set a date range 22/05/18 – 27/05/18 and special days as Thu and Fri, now booking price rule will be applicable on Thu and Fri lying in the date range22/05/18 – 27/05/18. Impact Way – In this field, a seller has to select whether the booking price rule will increase the price or decrease the price while booking a product. Impact Type – In this field, a seller has to select whether the price set for the rule will be a Fixed Price or in percentage. Impact Value – in this field, a seller has to set the value of booking price rule. 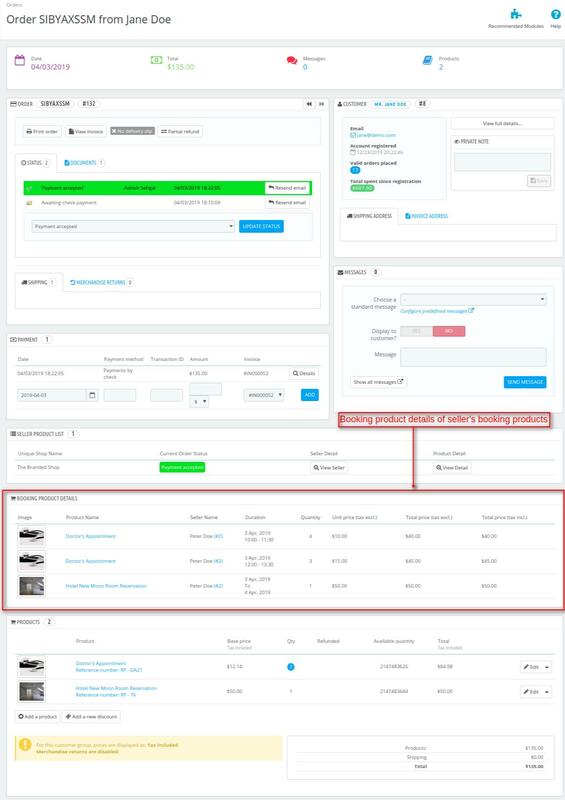 Admin can also view booking products price rules by navigating through Marketplace Management-> Manage Seller Booking Product-> Manage Seller Booking products Price Rules. Admin can add booking price rule on behalf of a seller to his products by clicking on “Add booking price rule” button. Booking price rules added by the sellers to their products will be visible to the customers if “booking price visibility to customer” has been enabled by admin from backend. 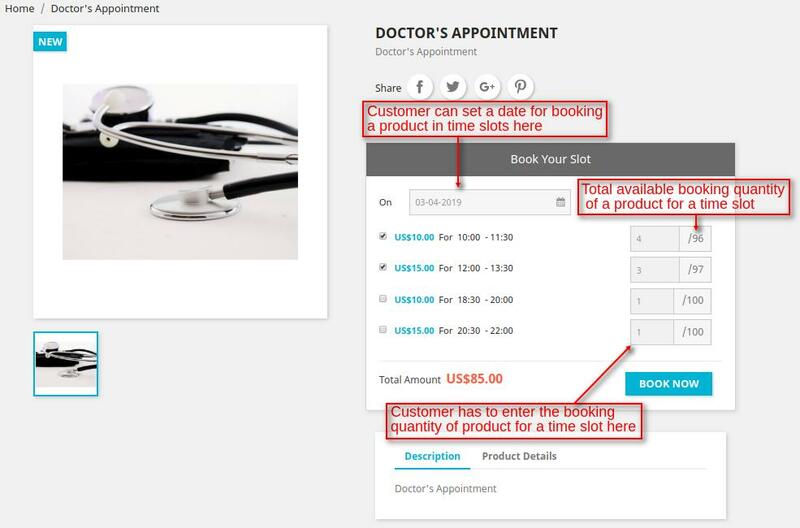 A customer can view a booking price rule applicable to a product. In Prestashop marketplace Reservation and Booking system, a seller can add a booking price rule to the product for a specific date range or specific date. The seller can add a booking price rule for a specific date range by setting ‘Date From’ to ‘Date To’. The booking price rule will be applicable for the date range set by a seller. 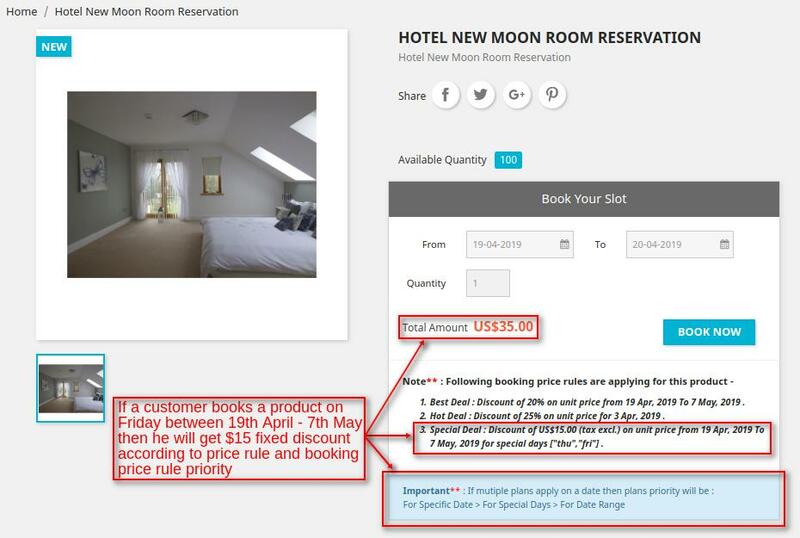 For example, a seller has added a booking price rule to a product for the date range 22nd May to 27th May and the customers who will book a hotel room during this duration will get 10 percent discount on booking. Booking price rule to a product will be applicable if a customer books a product during the date range set by a seller. A seller can add a booking price rule for a specific date. The booking price rule will be applicable for the date set by the seller. 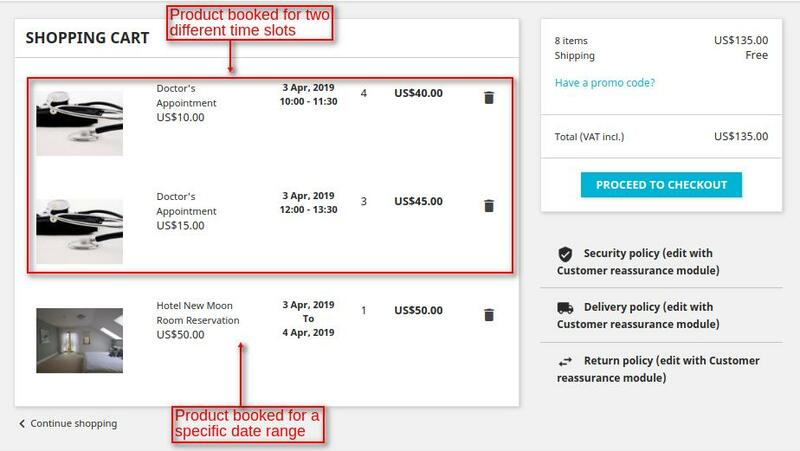 For example, a seller has added a booking price rule to a product for date 26th May and set $20 fixed off, then the customers who will book a product on 26th May will get a discount of $20 while booking a product. Booking price rule will be applicable if a customer books a product on the specific date set by a seller. A seller can add a booking price rule for special days which lies in a date range set by him. The booking price rule will be applicable for the special days lying in a date range set by the seller. For example, a seller has added a booking price rule to a product for date range 21st May to 27th May and special days Friday, and Saturday. The seller has set 15 percent discount in “Impact Value” field. Now the customers who will book a product on special days lying in a date range will get 15 percent discount while booking a product. Booking price rule will be applicable if a customer books a product on the special days Fri and Sat between 21st May to 27th May set by a seller. Under “Booking Price Rules Priority Management”, admin can set booking price calculation priorities so that if a customer fits into multiple booking price rules then booking price rule with the highest priority will be considered at the time of booking. For example, a seller has added 3 booking price rule on a product. Booking price rule for date range 19th April – 7th May and discount is 20%. Booking price rule for specific date 3rd April and discount is 25%. Booking price rule for special days Thu and Fri between 19th May – 7th June and discount is 15%. And the Priority set by admin for booking price calculation is: Specific Date>Special Days>Date>Date Ranges. A customer can view all the booking price rules applicable to a product at the Front End and the priority according to which he will get discount if he fits into multiple booking price rules. If a Customer books the product on 3rd April, then he will get 25% discount according to the booking price rule added to the product and booking price rule priority set by the seller. If a Customer books the product on special days i.e. Thu and Fri between 19th April – 7th May, then he will get $15 fixed discount according to the booking price rule added to the product and booking price rule priority set by a seller. 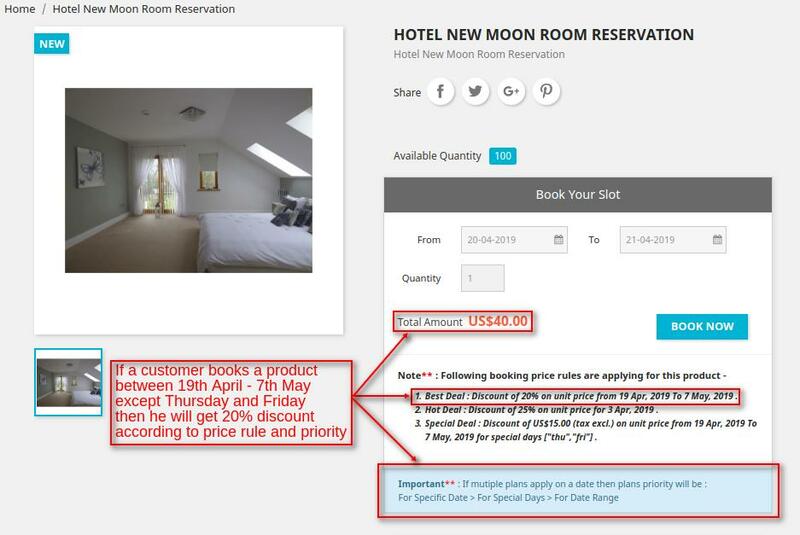 If a Customer books the product between 19th April – 7th May, then he will get 20% discount according to the booking price rule added to the product and booking price rule priority set by the seller. A customer can view the booking products on the category page at Front End. When a customer clicks on “Quick View” button, a pop-up will appear on the screen and he can book the product by clicking on “BOOK NOW” button. Has to set a date for booking a product in time slots. Can view total quantity available in time slots of a selected date. Has to enter the quantity for booking a product in time slots. Now when a customer clicks on “BOOK NOW” button he gets redirected to cart page where he can view the booking product details. 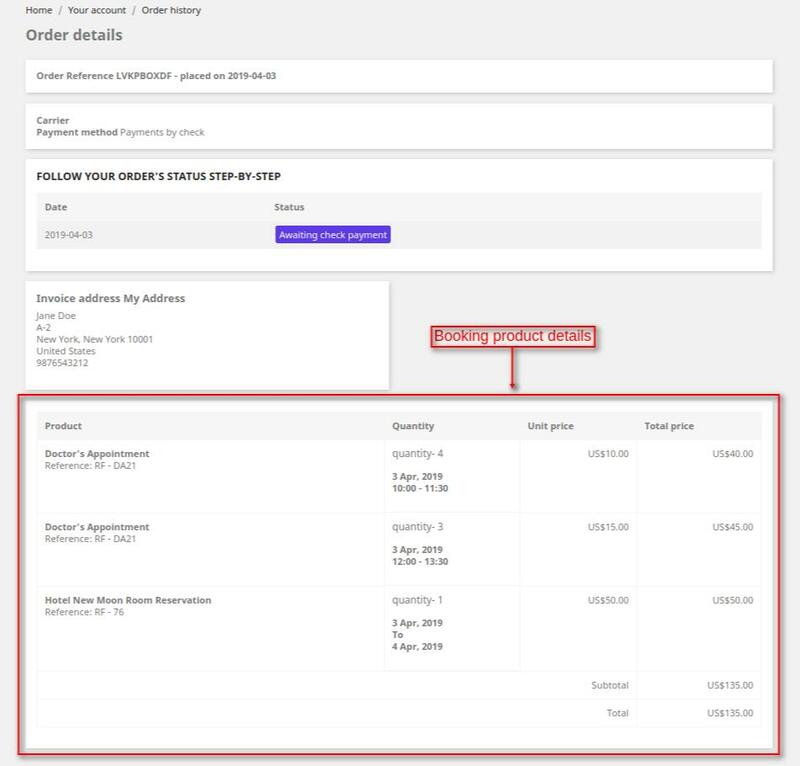 Once the order gets confirmed, a customer can view booking product details on Order history page. Once the customer has ordered the booking products, then he/she will get an order confirmation email in which the booking information will be mentioned. 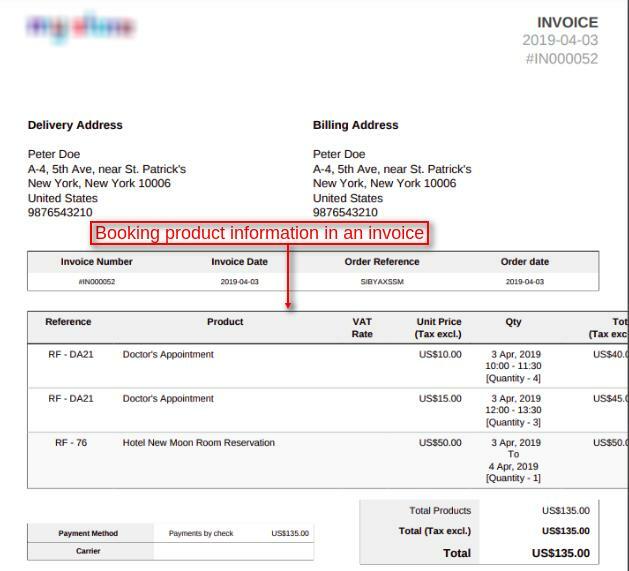 A customer can also view the booking product information in the invoice of an order. That’s all for Prestashop Marketplace Reservation and Booking System still have any issue feel free to add a ticket and let us know your views to make the module better http://webkul.uvdesk.com/. It would be great if the module allow to add feature. Thank you for showing interest in our module. If you want to show any info about the booking product on the product page then you can fill the detail in the product description and that info will be visible to the customers. So that we can discuss the possibility of customization according to your requirement.